Fellian Shard and his accomplice, Fario, first became known to the Moonhowlers during their investigation of the Lantern Street Orphanage while searching for the kidnapped children. 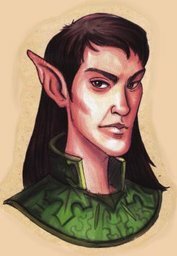 Gretchyn Tashyyk, head mistress of the orphanage, had mentioned that two elves from the City Guard had been one of the parties also sent to investigate the kidnappings. During a follow-up, the Moonhowlers discovered that the Guard had not sent any investigators nor did they employ any elves matching the description given by Gretchtn. Soon after, the Moonhowlers noticed on occasion the elven pair shadowing them throughout the city. The elves appeared once again during the showdown with Kazmojen. The duo managed to incapacitate the hobgoblin guards stationed between the lift and the bazaar, but upon entering the great hall Fellian was dropped by hobgoblin arrows almost immediately.